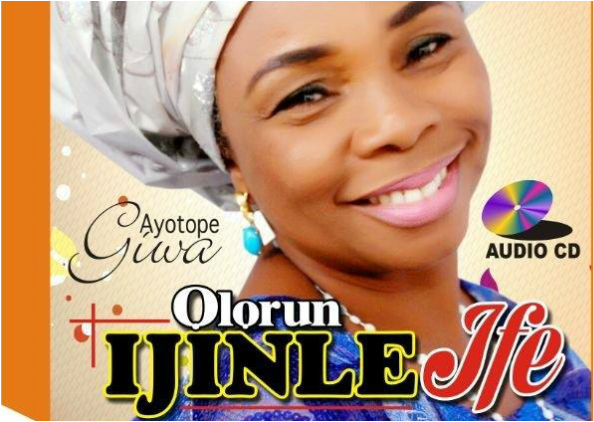 "Spread like fire, the news of my miracle, You are the only one that has made it possible for me to be a fortunate child," Ayotope Giwa, the General Overseer of the Immaculate Church, Ipaja, Lagos, Nigeria, sings in her debut Gospel Audio CD, "Olorun - Ijinle Ife". (God - The Depth of Love). All parents pray for their children to be fortunate in their lives' journeys, and are proud for children's journeys that turn out as they plan. Equally, all children wish to be the pride of their families, by excelling. The first seven words of the songs opening line as shown above is from the ending of the first part of the songs, before the second part with exhortation to God, to lead, to love and herald her into stardom. There is a soft play of instrumentation, which heralds a song about a joyful acceptance of an invitation to the house of worship, and how her joy has been fulfilled, and how she has been praising Jesus with beautiful dancing steps. The song's theme weaves around believing that she is a child of God, the journey with God and the success. The songs then move to the importance of worship and forgiveness in the relationship between humans and God. Here, the singer says there is no forgiveness for people who don't want to do the will of God and worship him. She evokes the power of God and His ability to save, with a recollection of the battle between the Pharaoh of Biblical Egypt and the children of israel. She sings that it is the power of God that saves the innocent imperiled by the powerful people on earth. Believing that Jesus is the only one capable of helping beyond the capability of earthly parents, relations and friends and the only power that can save from perilous situations, the singer recalls the role that destiny plays in whatever circumstances humans find themselves, evoking the power in the blood and the water that flows from the wounds of Jesus on the Cross, the assurance of daily bread and that Jesus is sweet and sweeter than honey. She calls on all listeners to join her in praising Jesus. It is true that the struggle for survival almost imperil the work to praise God with explanations that she has been destined to be a singer from her youthful days, but still that the endowment of long life has enabled her to achieve the objective and that the inspiration is from God. The first part ends with spreading the news of her miracle with fire and continues on the second part with what she says God has done by lifting her up. "High, high, I will go. My wealth will multiply and I will not go down." There is effort at creativity here, playing with words like 'escalate', 'escalator' and 'Escalade', to describe her current situation and that her situation of positive escalation has been made possible by heaven. One cannot help, but move the dancing feet, while listening to this rendition of songs, fast paced, with excellent vocal, instrumentation and back up. The high point in the songs is the believe that the love and mercy of God are all that are needed along with hard work to achieve our life's goals. Of course, for the General Overseer, who has been traveling almost every six months between Nigeria and America since 2012, to take care of her young children and the Church in Nigeria, and be in the U.S. to take care of her husband, the God that she worships must have been generous enough, in term of provision for tickets and security in the course of her journeys. Now, all the six months, six months travel will end with all her young children migrating to America, and she will only have to manage her Church from the U.S. What else can a woman of God thank God for, considering all that God has done for her?